Discussion in 'GMC Jam' started by Alice, Aug 10, 2017. @johnwo i like watching your vid because its funny. Unfortunately it is not a real game review vid. Its just extremely short opinion of each entry with no constructive criticism. I was really hoping to hear any suggestions or ideas about improving my jam experience or something but I didnt. It was fun though. Funny thing is that you did exactly the same thing that I did when i played Verizon Horizon. I bashed the space bar continously until I discovered which key was it I had to press. If you like to try it out again, press the Z key to continue. Also I just discovered another problem with my entry and it had to do with delta time. It cause the speed to run terribly fast than the average gravity can support on other hardware. People could not properly get pass the tree due to that small dilemma. Ill have to avoid using delta next time since its risky to use. I think the biggest problem about my entry was that bug on falling continously since so many people here actually fell into that. Its a matter if trying the entry without falling down that cliff. Anyway good job everyone. @johnwo i like watching your vid because its funny. Thank you! Fun was what I was aiming for. Unfortunately it is not a real game review vid. Sure it is! It's right there! You can watch it at any time! Its just extremely short opinion of each entry with no constructive criticism. I was really hoping to hear any suggestions or ideas about improving my jam experience or something but I didnt. Did you seriously expect to suggestions or ideas on how to improve from a random drunk guy?! In any case, I would argue that the video is full of constructive critisism (see below). Funny thing is that you did exactly the same thing that I did when i played Verizon Horizon. I bashed the space bar continously until I discovered which key was it I had to press. If you like to try it out again, press the Z key to continue. Well, ****... I got to play the game now, at least. The thing is: If what you have to do to start the game isn't apparent to a drunk dude (and the game comes with no readme) then that's a good pointer on how to improve the game; so technically, that could be interpreted as constructive critisism. So me pointing out the falling bug highlighted a problem? I would recommend avoiding that for all jam games. I only find it necessary if you're trying to make a multiplayer or rhythm game. johnwo and matharoo like this. Its not real constructive criticism if you dont elaborate it properly. Take Yals entry for example, you only said its a puzzle game and that was it. You think that was helpful for Yal to know how her entry came out or how much progress she has done? No it does not (although I dpnt know if yal cares) but your review is just not the kind that supports most others. I ****ing hate myself for not including a readme file that said that you could skip the messages with enter. What a mistake. When you flip a coin, there is a ~1.5 second delay on it. If you press and hold Z, your character will extend their arm, but not flip. The actual flip command occurs on (if I remember correctly) frame 90, and holding the Z key will keep the animation at frame 88. This way, you can press and hold Z and control the release of the coin for some of the trickier or more timing/reflex bases segments. That being said, some of the "safety" checks on this mechanic was the cause of the error which turned out to be very reproducible: having a coin hit a wall and begin the process of flipping while the player was teleporting out of the level instigated the crash. I'll have a fully fixed post-Jam build up in a day or two. I'm still contemplating if I want to open source the project for the hell of it, which would require me to clean up my visually sloppy game jam code. I'll expedite that if folks are interested. So, when is the voting period over? Technically speaking, 3 hours and a bit. I won't close the topic sooner than that. Practically speaking, after I wake up the next day, I will close the voting topic, proceed to do the tally, made some last arrangements and publish the results. Either way, it shouldn't be later than 24 hours from now. So I just found out that the jam shows my afterward readme file for both things on the readme buttons, fml. I think I was told before, don't remember. Either way it's fine, I still had fun in the jam, still working on Soul Catchers and taking criticism into account. I just play what's in the zip, man. I didn't really have the time to go back through and check if there were fixed versions to download separately. Alright, the the voting topic is closed, and I'm about to tally the results. You can expect them in several hours, I suppose. "This is a game where balls fly at you from all directions. It gets progressively harder and when you finally fail you get to publish your score to the online highscore list. Neat!" What confuses me is, who is this for? Surely the reviews are for the developer of the game? Then to whom are you presenting what the game is about? Because I definitely know. There are some lengthy reviews as well, describing what the game looks like, how to controll it, what your choices are etc. Simply stating how things are without adding any suggestions or thoughts about them. "It's a fast-paced game with instant death and instant restart". When I read this I think to myself: "Yes. Yes it is...?". These are nobody's reviews by the way, I made them up but they share the same structure as the real ones. I'd say give it to several people if you're having a hard time deciding. I'd vote for K-BitCRUSH, not because he did everything right but since I think video reviews are infinitely more helpful and I'd like to see him continue with it and make even better ones for the next jam. My suggestion there is to record the first-time playthrough. Not seeing how people tackle your game when they first boot it is a HUGE waste, as it's the by far most important thing you could possibly show me. TonyStr, chance, DocNogloff and 2 others like this. I understand your point, and I agree with it, most of reviews (including mine =p) may be not that helpful for the people who made the game. But I do it in that way, personally, for 2 main reasons, first it is time, it is pretty hard to give a decent, deep and useful review for 40-50 games, that would take an amount of time that unfortunately I dont have. The other point is because, in my humble opinion, game jam games are made all with so short time and limited team members and everything(especially the 48 or 72 hours jams, like this) that only the fact of submitt a playable game it is already something to "celebrate" and be proud of. Of course that a constructive criticism is always welcome, but I like to focus on what I liked and highlight what worked well, and if there was something that really bothered me I may give a suggestion or a tip that I think it could make the game or the development process improve in the future. Wraithious and chance like this. I always look for both sides in my reviews. Not just only pointing out the mistakes or flaws but offering ideas what could possibly bring better advantage for the entries for future development or considerations. Its ok to recognize where your potentials and good sides are but its way more important to know where you are left off in general to build up away from your flaws. Honestly I did not like how this jam turned out. It was quite great during the jam phase but the voting phase this season has lead to trouble with the community that tears most of us apart. The fun only resides on the jming part since we are free to do what we can apply in our work but the voting part seem to have misunderstandings on comunicating with the participants and certain stuff. I really hate to see this happen even for next jam. I dont know what to expect the next time. I was way to harsh with my reviews, mostly because of an unrelated bad mood. I hope I managed to give some useful feedback, but overral not proud of my comments. Anyway, when is the voting over? 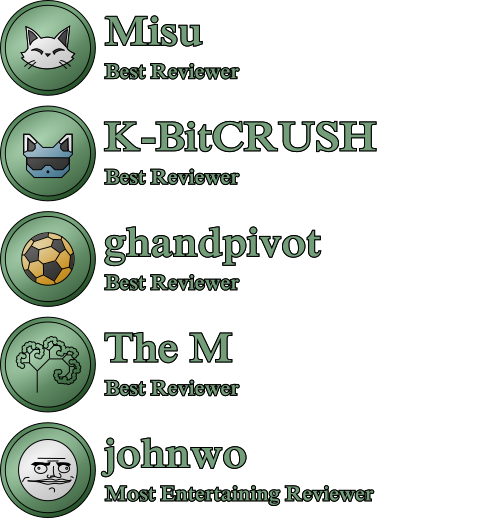 Best reviewers: @Misu and @The M for detailed and helpful written reviews, @ghandpivot and @K-BitCRUSH for complete video reviews, and @johnwo for entertaining gameplay montage. In addition to getting the special banners, the top 3 entrants and best-of winners will be featured in the Hall of Fame. Also, @TehPilot can choose the theme for the next Jam when the time comes. Please don't forget to check if you aren't eligible for one of community prizes contributed to this Jam's pool, and poke the prize givers if necessary~! DocNogloff, Bingdom, Wraithious and 6 others like this. Cheers for the jam everybody! I had a blast creating a much quicker and smaller game and I think I'll keep trying to optimize my ideas as it made the whole jamming experience more fun! That's not quite what I said though. I'm very much for pointing out what is good, I'm very much for pointing out what is bad. I'm against pointing out what just is and leave it at that. "I liked the bouncyness! 9/10" is a way better review than "This entry is about a man who walks along the beach while wearing a shirt and looking at the ocean and thinking about stuff. You walk with the arrow keys". The first thing contains information, the second one does not. A review that only points out what was nice is also a good review and better than one which doesn't really point out anything. @Misu Congratulations, you get the YYG stuff! It's better than the 5th. And @Alice great work on the medals ! I loved the @TehPilot medal and the @Misu medal haha, they look great ! Congrats everyone! I'll admit I wasn't a huge fan of this jam, but it was still fun making art and watching reviews come in. Hopefully next run will be more enjoyable. The breakdown spreadsheet seems to go to a different GMC Jam. It works fine for me, what are you getting? Woooo. I won a prize. Anyway, congrats to all. Next jam will hopefully be better once I prepare myself even more this time. I didnt had enough time to dedicate with this entry so Im gonna try to put time for the next. Btw @Alice i was wondering something since i notice there is a reviewer part in the hall of fame thread. Why isn't that ever updated as well? Barvix and matharoo like this. Second, eh? Well, given how varied the votes were I'm both surprised and more than happy with that. 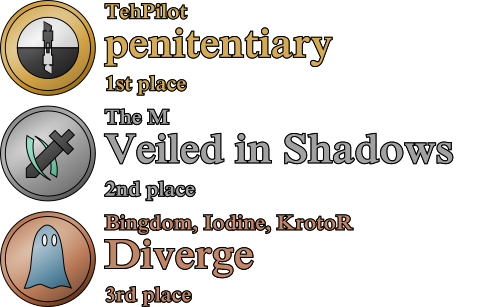 Congratulations to @TehPilot and everyone else who participated! Now I can't wait for the next one...! Ok I see. It’s weird how the mobile google docs app shows multiple spreadsheets. Nice. Thank you all for the support! matharoo, DocNogloff and Wraithious like this. Not much of a fan from a few of the discussions/reviews that occurred here. I hope next Jam is a little better. This was really unexpected, considering how much more work I put into previous jams compared to this one. Just noticed some of the ranks match closely to mine which is neat. I expected to rank lower as well, so that's a nice surprise. Well that was fun! Even though my game got a low rank, I’m glad that some of you liked it. When is the next Jam? Aren’t these usually around every 3 months? When is the next Jam? The next Jam should occur around the last week of November, probably between 24th and 27th. The M, 0.Bytes, Barvix and 1 other person like this. Nice job everyone. 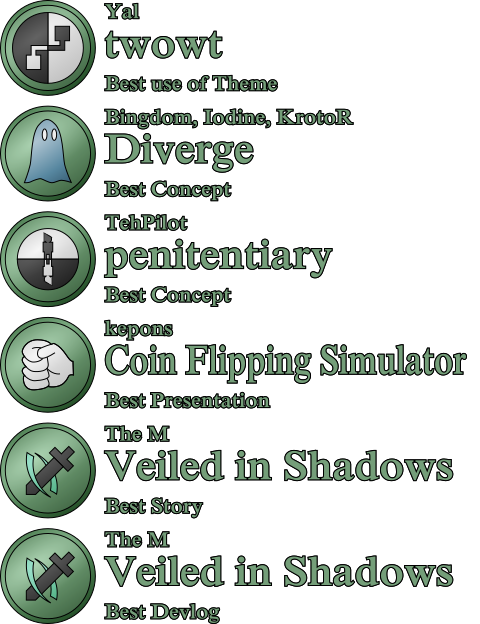 There were some good games here -- several of which might be worth continuing. Maybe even marketing, who knows? And kudos to @Alice, as usual, for an extremely well-organized and executed Jam. @Ragarnak has big shoes to fill. EDIT: not that Alice's feet are too big. I'm sure they're quite attractive. Wraithious, 0.Bytes, Barvix and 2 others like this. Congratulations guys. @Yal, well done for finishing in the lucky-for-you 13th place. @Misu is in the 13th place. matharoo and Barvix like this. The mistake is because of the title in the first line, I think that line was not on the sheet yesterday. You mean other than coin flipping? What @chance said. These past jams have been great! Gotta go with tradition. Too bad I never got fourth or I'd have covered top 5. Can you email me your details at community@yoyogames.com. Also could you kindly specify what are those details I need to provide? I can only assume its mail address but not sure if that is all. Please do PM me. Yo @TehPilot @The M and the team of @Bingdom, @Iodinex64, @KrotoR. PM me for lovely, lovely, steam games. For the team, let me know which person should get the game.